Machin ACP/PVAD u64 Connoisseur ccm A13? 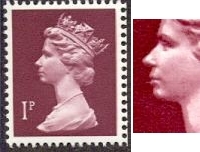 ex 50p booklet B2 Head. Heavily overinked resulting in a very thin value and dramatic ink bleed to the front of the queens face and right margin.